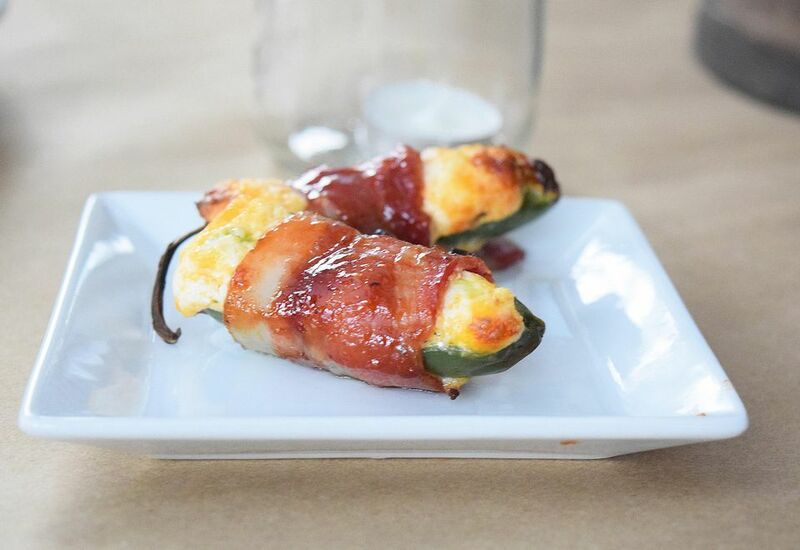 These bacon-wrapped jalapeño poppers are always a huge hit at parties. They are sweet, smoky, spicy, cheesy, creamy, and crunchy. They've really got it all. This recipe is inspired by the Pioneer Woman's BBQ jalapeño poppers from her The Pioneer Woman Cooks (which just happens to be a Bible of ours). These poppers cook up super quickly and can be on your Christmas or Brunch table in no time! Just be careful when you are deseeding the jalapeños! Make sure to wash your hands really well before touching any body parts! An assembly line works super well when putting together these babies! These will go fast, so make sure to make plenty! Make sure to get that good bacon. It's the highlight of this dish! Cut the jalapeños in half, and use a spoon remove the ribs and seeds. Keep the stems on to help hold in the filling. (It also looks pretty!) Wear gloves if needed, or wash hands well after this step. Mix together the cream cheese, cheddar cheese, and scallions until totally combined. It combines the easiest if you make sure to soften the cream cheese first. Cut bacon strips in half. If your jalapeños are especially large, just use a full slice of bacon. Stuff the jalapeños with a large scoop of the cream cheese mixture. The cream cheese filling should rise a little over the edges of the hollowed-out jalapeño -- but not too high, or it will just spill all over when it cooks. Wrap the jalapeños with a strip of bacon. Be sure to wrap gently as the bacon will shrink a bit as it cooks. Secure the bacon on the jalapeno with a toothpick, and place it on a cooling rack on top of a baking sheet. Whisk together the apricot jam with the barbecue sauce in a small bowl. You may need more of both depending on how much you spread on each jalapeño. Spread a thin layer of the sauce over the top of each jalapeño popper using a spoon or pastry brush. Repeat with remaining jalapeno halves. Enjoy these little bundles of goodness right away!